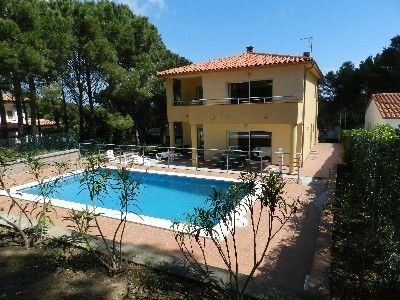 Very beautiful newly built holiday house with private pool. Newly-built detached holiday house with private pool in Playa de Pals. Ideal for families sharing. The self-contained upper floor contains a large, cosy living/dining room with seating, satellite TV and balcony, 1 double bedroom with double bed and en suite shower bathroom/WC, 1 double bedroom with double bed and balcony, 1 double bedroom with 2 single beds , 1 bath/WC and fully equipped kitchen also with a small balcony, dishwasher and washing machine. The lower floor contains a large, cosy living/dining room with seating and satellite TV, 1 double bedroom with double bed and en-suite shower/WC, 2 double bedrooms with single beds. 1 full bathroom/WC and fully equipped kitchen with dishwasher and washing machine and balcony. The garage has space for 4 cars. Shops and restaurants just a few minutes away on foot. Distance from beach ca.800m. Pals is on the edge of the Pyrenees and its snow-decked peaks provide a uniquely beautiful scene in spring and autumn. Lots of sun, the beach, flowers and greenery are the trademark of the Costa Brava. Pals and its surroundings have a lovely mediaeval town centre and typical little streets. Pals resort has the romantic Old Town as well as lots of sport such as tennis, horse-riding, hiking and cycling. The new golf course nearby is great for all golf lovers. Im Mietpreis sind der Verbrauch von Wasser, Gas und Strom inbegriffen. Die Bett- und Toilettenwäsche ist selber mitzubringen.